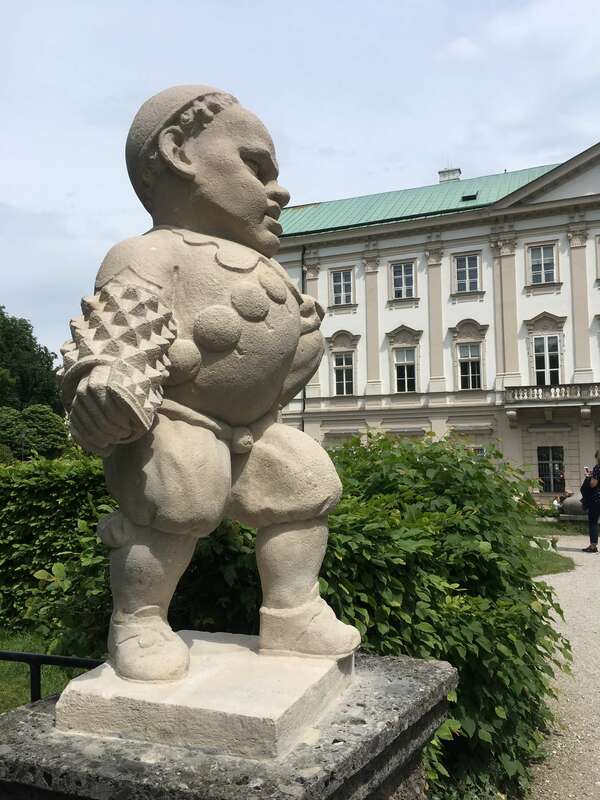 I strolled around the Mirabell Gardens killing a little time before it was time to board the Sound of Music bus. It was the perfect weather at the end of May. I sat down by the Pegasus statue looking up at the Hohensalzburg Fortress in the distance. The dwarf garden lay to my right, famous for its statues of little people who starred in the Sound of Music movie during the do-re-mi montage of musical scenes. It feels tempting to skip through the ornate garden singing along to the movie soundtrack but the time was ticking and it was time to head over to the tour. The red bus with its Alpine scenery and huge picture of Julie Andrews and the von Trapp children bursting into song left no doubt this was the right place for the tour. People from the world over packed into the bus getting ready to explore Salzburg’s movie and music legacy in and around the town. With the soundtrack playing over the bus tannoy, a few people sang along. 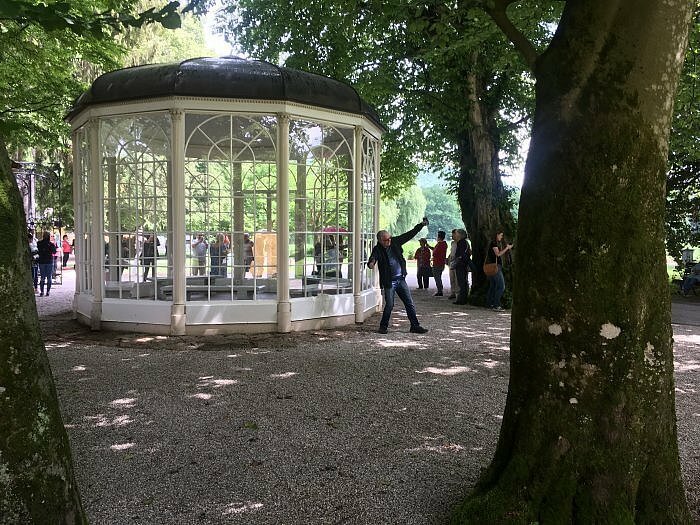 We took the road out of Salzburg and headed over to Hellbrunn Palace to the Gazebo. The Gazebo wasn’t built here, but was constructed especially for the film and got transplanted to the outer grounds of this baroque pleasure palace. In perfect timing, the rain began to drop on the glass as people posed for pictures and sang “16 going on 17”. Soon the time was up and it was time to get back on the bus. 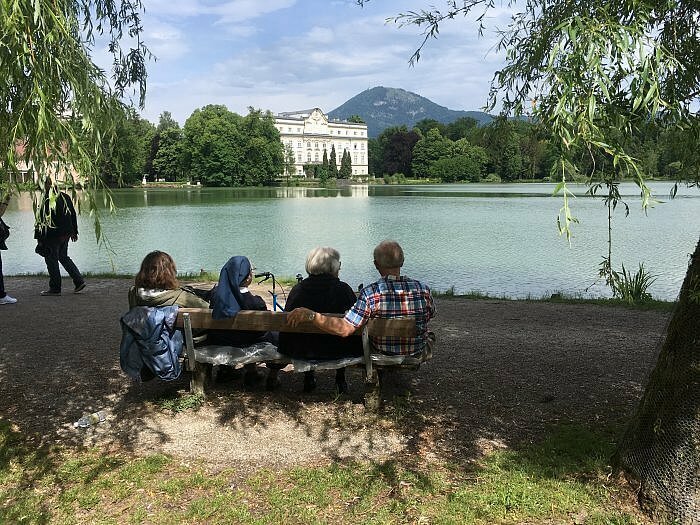 Our next stop was the Schloss Leopoldskron, where the back end of the von Trapp villa was filmed by the lake. We could only watch it from afar, as the property is now a private hotel. But it was enough to get a feel for the atmosphere. The rain stopped and the clouds cleared over the Untersberg Mountain in the distance and the Hohensalzburg Fortress to the other end of the lake. A group of old women, one a nun, sat down on the bench and just watched the water, oblivious to the tour group crowding round getting the perfect selfie before our guide shuffled us off. lines infecting each photo, but still no picture was better than nothing and you could just about capture the red dome on top of the convent church tower. 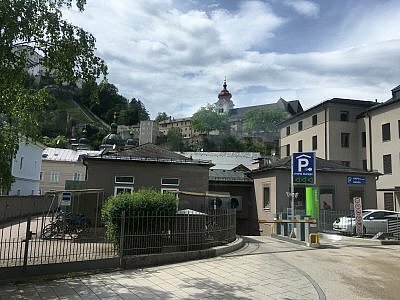 The surreal thing about Salzburg is every corner looks like a movie set, unaged and unprocessed (except for a few modern additions like the car park). Everything appears like it hasn’t changed since the day it was filmed, even the gazebo that got moved to another palace. 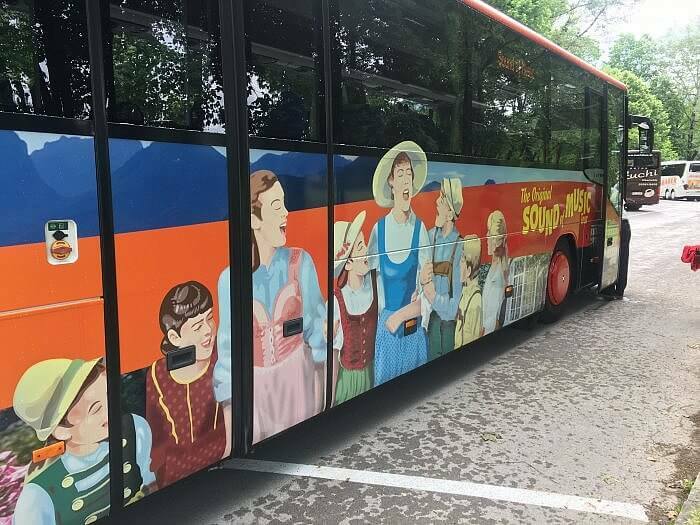 But there was more to the Sound of Music than villas and convents and it was now time for the bus to drive up into the hills that were alive with the Sound of Music! Close to Salzburg, the lake district is filled with mirrored blue basins of water surrounded by rugged peaks and swerving pine clad roads. We drove through the scenic route dotted with villages with triangular roofed houses with the soundtrack in the background, stopping on the hill over the Wolfgansee to take pictures. Little white boats glidded across the blue waters and the old cable car carried people up the mountain side over trails of alpine flowers. 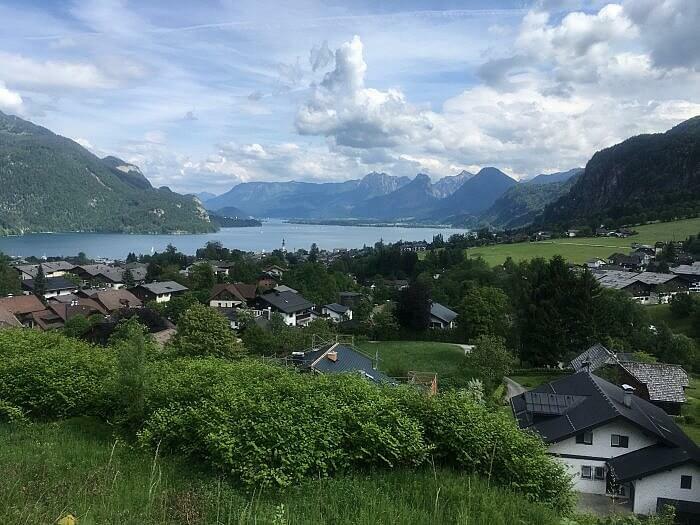 We then wound down to the Mondsee, skirting the edge of the lake, watching young kids bathe in the clear water before reaching the village. 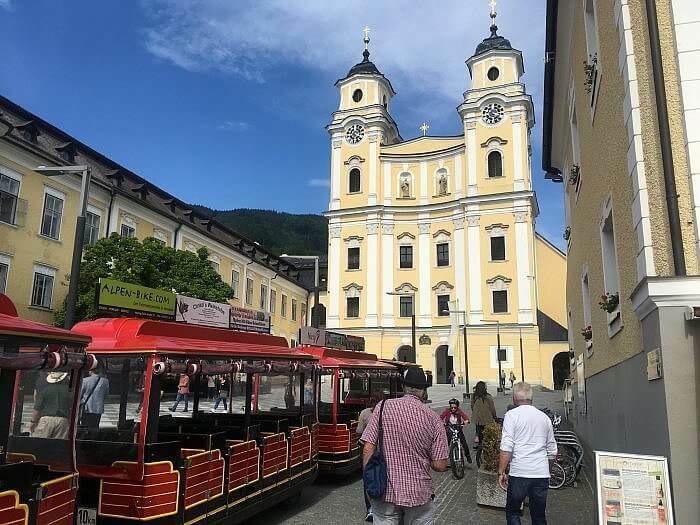 Some chose to walk, others hopped on the little dotto train that carried us up to the church where Maria and Captain von Trapp married in the movie. Apart from the tourbus, this piece of movie history was uncrowded. An hour from Salzburg this was not on the tourist trail, and only really visited by people on the tours, or traveling by car. However, there comes a time when there is only so much Sound of Music I can take and escape into the cafe next door for a cake and a coffee.